Pra quem ia lançar um disco para cada estado americano, Sufjan Stevens estava muito calado. Hoje em seu site disponibilizou por $5 dolares ou streaming for FREE o seu EP . 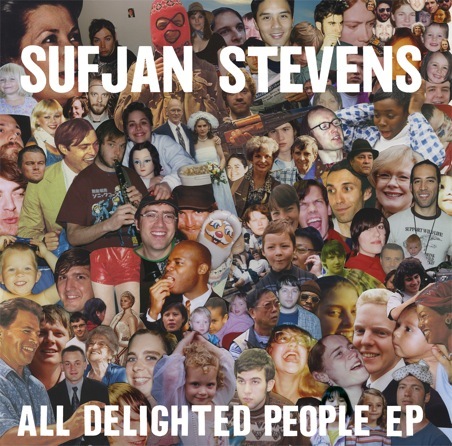 The EP, All Delighted People, is built around two different versions of Sufjan’s long-form epic ballad “All Delighted People,” a dramatic homage to the Apocalypse, existential ennui, and Paul Simon’s “Sounds of Silence.” Sounds delightful, yes! The song was originally workshopped (oh we hate making workshop a verb, but time is money!) on Sufjan’s previous tour in the fall of 2009. Other songs on the EP include the 17-minute guitar jam-for-single-mothers “Djohariah,” and the gothic piano ballad “The Owl and the Tanager,” a live-show mainstay (and Debbie Downer if you ask us; what’s it doing on a “Delighted” EP?). Sufjan Stevens e Paul Simon. Quer mais? Ouve de graça ai abaixo!